To deliver applications with shorter development cycles and lower operating costs is to achieve greater business value. But, in order to do so with success, the development and operations processes must be integrated so that they function not as disparate silos, but work in symbiotic tandem to streamline the app development and management cycle. 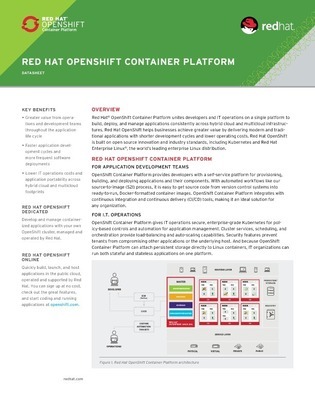 In this compact datasheet, you’ll find a technical rundown of Red Hat OpenShift Container Platform, a single platform used to build, deploy, and manage apps consistently across hybrid and multicloud infrastructures. Read on to see how this platform unites the needs of both app development teams and IT operations, with the CI/CD tools integration that developers want, alongside orchestrated load-balancing and auto-scaling capabilities for ops.